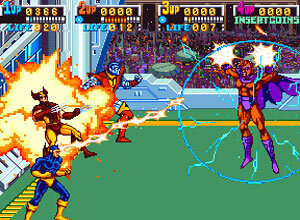 From one arcade to another: Marvel announced last night at New York Comic Con that the original 1992 X-Men arcade game will be ported to the Xbox Live Arcade, as well as the PlayStation Network. Previously, Konami was unable to obtain the rights necessary to release a digital version of X-Men in the midst of the digital content delivery craze – but now, Marvel has decided to team up with Konami and Activision to create the port. The port will feature a mix of old and new; all six original characters will be present and accounted for, along with their original moves, the old graphics, and the memorable (if ridiculous) storyline. The voices had to be re-recorded, but supposedly they are convincing enough likenesses to the originals, and the menus have been redone. Much to my chagrin, there doesn’t appear to be a release date yet. But due to my penchant for arcade games and my desire to one day own an arcade machine, I’ll be waiting with bated breath until it comes out.